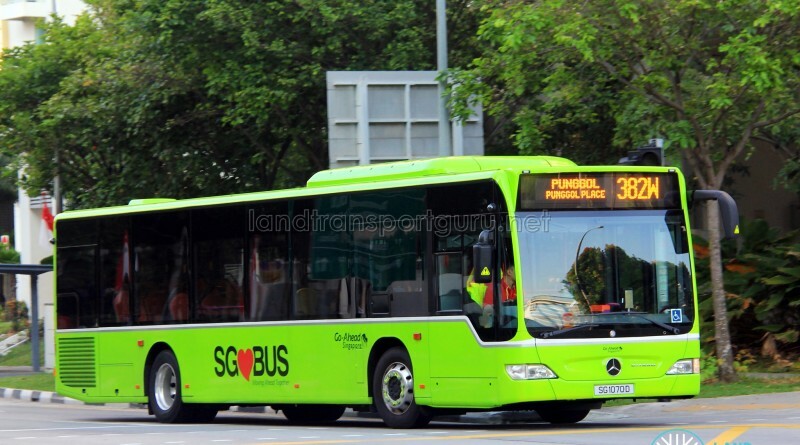 Go-Ahead Feeder Bus Service 382 is a residential feeder route operating between Punggol Bus Interchange and Sumang Walk, passing through Sentul Crescent, SAFRA Punggol, Punggol Waterway Park and Sumang Lane. Bus Service 382 operates in a bidirectional loop with two directions, Green Plate (382G) for the clockwise loop, and White Plate (382W) for the counter-clockwise loop. Service 382 provides residents of Punggol West with greater connectivity to transport nodes at Punggol Central, namely Punggol MRT/LRT station and Punggol Bus Interchange. It also serves other amenities in the neighborhood, such as Punggol SAFRA, Punggol Waterway Park and Waterway Point. 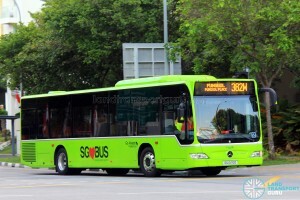 Launched on 03 January 2016, it is the 55th service to be rolled out under the Bus Service Enhancement Programme (BSEP), as well as the first BSEP service introduced with Green and White Plate variants (Similar to 859A/B, but SBS Transit has traditionally used G/W to differentiate such routes). The service loops at Sumang Walk, a new road that serve new housing estates in Punggol West without LRT connections. The new Service 382G & 382W will benefit residents of newly-built residential developments in the Punggol West, namely the HDB Bulit-to-Order (BTO) developments of Waterway Cascadia, Waterway Terraces as well as the various BTO developments under construction, such as Punggol Bayview and Punggol Vue. It will also serve the upcoming Punggol Cove Primary School. 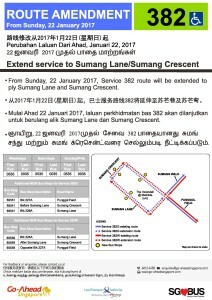 Bus Service 382 was extended to serve Sumang Lane and Sumang Crescent from 22 Jan 2017 in tandem with the new housing developments of Matilda Portico, Matilda Edge, Matilda Court and The Verandah @ Matilda. The services continues the 38x series of route numbering used for Punggol Feeder Routes. 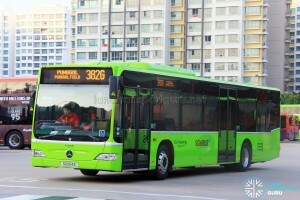 It is the second feeder bus route at Punggol after Feeder 386. 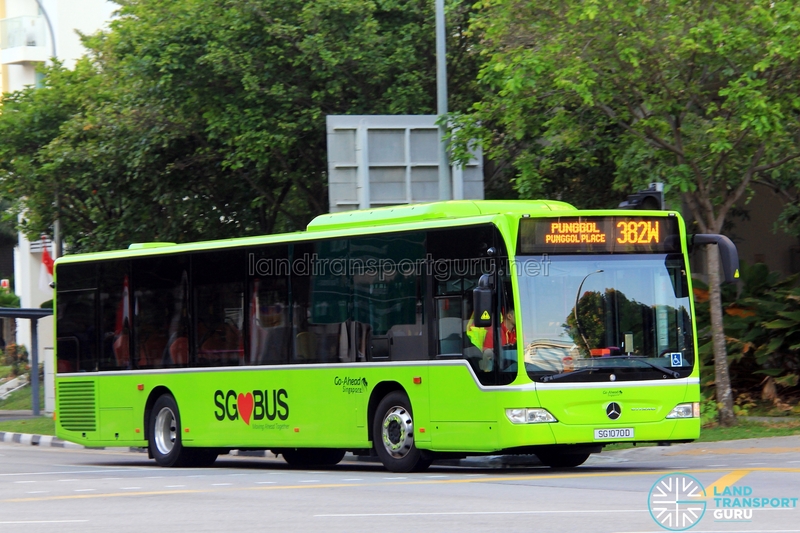 Service 382G/382W was handed over to the Go Ahead Group from SBS Transit in September 2016 as part of the Loyang Bus Package.